Domestic umbrellas allow you to make the most of your outdoor area, easily setting up a shaded spot anywhere in your backyard. 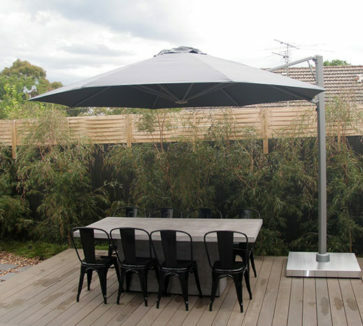 Whether you want to provide a shaded area for your children to play under or for you set up your BBQ, Coolabah Shades can help you find the right domestic umbrella for your lifestyle. Domestic umbrellas are also particularly useful for those who do not have a deck or patio, but still want to create an outdoor living area. For more information or to discuss your special needs, just email or telephone and one of our friendly staff can arrange to meet with you for a free no obligation measure and quote or go to our contact us page.